DENVER, COLO. (Sept. 27, 2018) – Colorado Nonprofit Association received a Gold Hermes Creative Award for the Fall 2017 issue of Nonprofit Colorado magazine. The Hermes Creative Awards is one of the world’s largest competitions honoring the messengers and creators of traditional and emerging media. We are proud to have Nonprofit Colorado honored as part of these international awards,” said Erin Spletzer, art director and editor of Nonprofit Colorado. 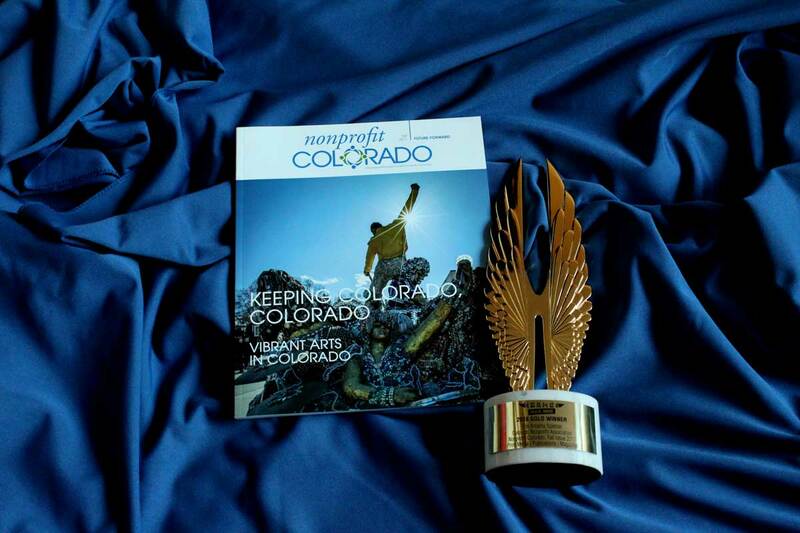 “We share this award with all of our members and contributors who have helped us produce this high-quality publication that showcases the vitality of Colorado through the lens of the nonprofit sector. The awards are administered by Association of Marketing and Communication Professionals. In 2018, there were 6,500 entries from across the U.S. and 21 other countries. Entries are judged independently by industry professionals who seek to honor companies and individuals whose talent exceeds a high standard of excellence and whose work serves as a benchmark for the industry. As an award winner, Colorado Nonprofit Association joins brands including DaVita, Empower Retirement, Morris Animal Foundation and Regis University in Colorado.